The Victorians had the right idea: rest and relaxation was a concept they took very seriously indeed. Deter­mined to escape the smog and clamour of the city, they created spa towns to retreat to at the week­end. In keeping with their ambitions, these getaways were suitably grand, so much so that many of their large villas remain intact – and in demand – today. Crieff was one such destination for the Victorian escapees, attracting weekenders from Perth and Dundee as well as Glasgow and Edinburgh. 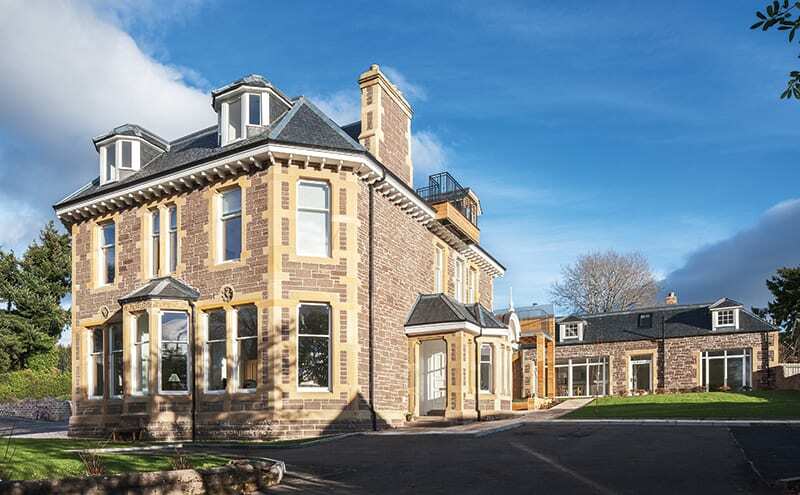 The enduringly popular Crieff Hydro brought people to the area in search of lawn games and hydrotherapy and, while the spa treatments on offer have changed over the years, the hotel, built in 1878, still operates as a family-run business. At its gates sits Dalmhor House, an imposing villa designed as a striking domestic residence but latterly used as a boarding house for the town’s independent Morrison’s Academy. It had been lying empty for five years before builder and developer John Burke took the project on. 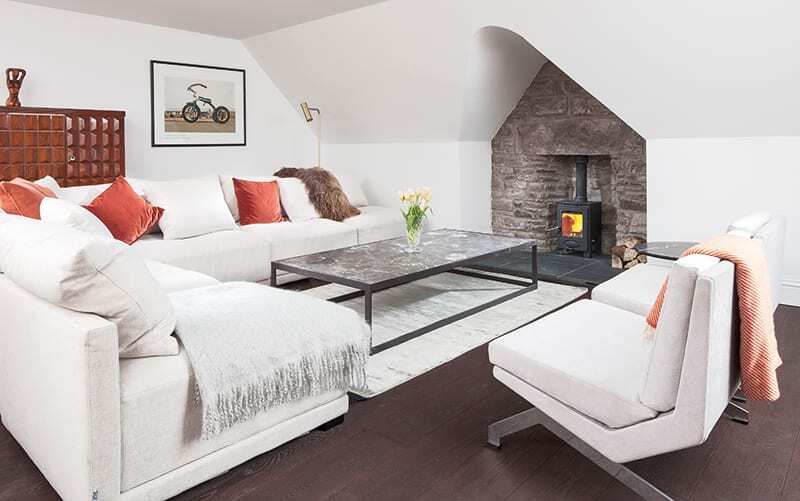 The Victorian Dalmhor House in Perthshire was a school boarding house until it was renovated, creating three modern apartments; the original coach house has also been converted into a single dwelling that makes the most of the rural views. His firm, Corryard Developments, had recently completed another renovation project in the area but taking on this classic Victorian structure seemed like too good an opportunity to miss. So he bought it and, together with his wife, interior designer and architect Susie Whyte, set about giving it a new lease of life. Rather than simply reinstate it to being a single dwelling, the couple could immediately see the potential to change the layout and make something more suited to modern lifestyles. Although Dalmhor House is in a conservation area, it is not a listed building, so they had some leeway to make changes. All of the windows and doors, for example, were taken out and replaced with more efficient models that reference the period detailing but perform better than their Victorian counterparts; the weight-hung sash-and-case window frames were retained for an authentic look. John and Susie worked with architects McKenzie Strick­land Associates to devise plans to submit to the local planning office. The shell of the building was in good health but their intentions for the inside would entail fundamental changes to the layout. “We wanted to create three separate apartments within the house itself, as well as to convert the original coach house and build a new property in the grounds,” says John. 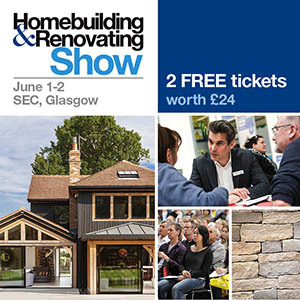 The results demonstrate how traditional struc­tures can be successfully transformed to suit the needs of contemporary homeowners. A sympathetic approach has taken the best elements of the era and incorporated them comfortably in a subtle, simple modern design to create a harmonious mix. Corryard’s 15-strong team of builders, joiners, electricians and tradespeople worked full time on site. The exterior of the building was solid and just needed sprucing up, so the team set about power-washing the sandstone then repointing it with lime mortar. Structurally, the roof was also in good shape, but all the tiles and leadwork were replaced and upgraded. Work was done to the chimneys to accommodate the wood-burners that were being installed in each apartment. The top-floor apartment embodies the pared-back aesthetic of the new interiors. It shows off the way the old and the new have been combined to get the best out of each. It is now a two-bedroom, two-bathroom pad with open-plan living areas that have wonderful elevated views over the surrounding Perthshire landscape. Double doors lead to the open-plan living/dining/kitchen area. Since this floor would have been designed originally as the servants’ quarters or the children’s nurseries, the ceiling heights are lower than in the grander ground and first floors that historically would have been used for formal entertainment. John and Susie have compensated for this by inserting two skylights into the roof to bring in as much natural light as possible. The original fireplace stonework was unearthed during the renovation and has been cleaned up and retained as a surround for a contemporary wood-burning stove. 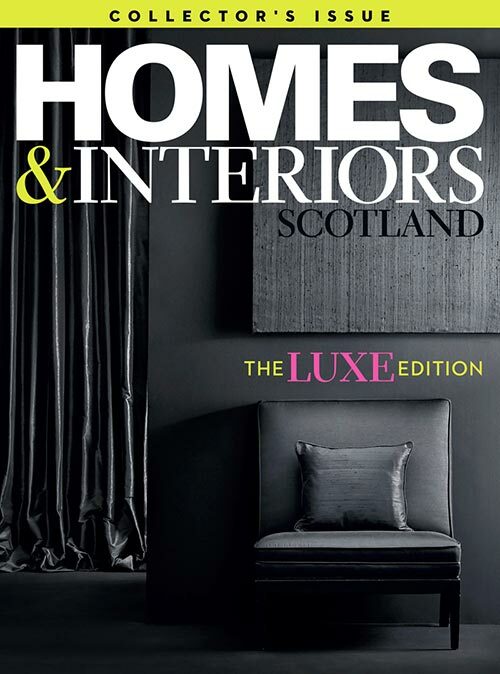 Underfloor heating (installed by local Perth company Colco) contributes to the sense of understated luxury. Strathearn Stone & Timber’s deep burgundy-hued Chambord engineered oak acts as a foil to the Cameron Interiors Bulthaup b1 kitchen that is the central focus of the space. Buffed up with timber oil, the floor’s reddish hue has depth and style against the expanse of white. 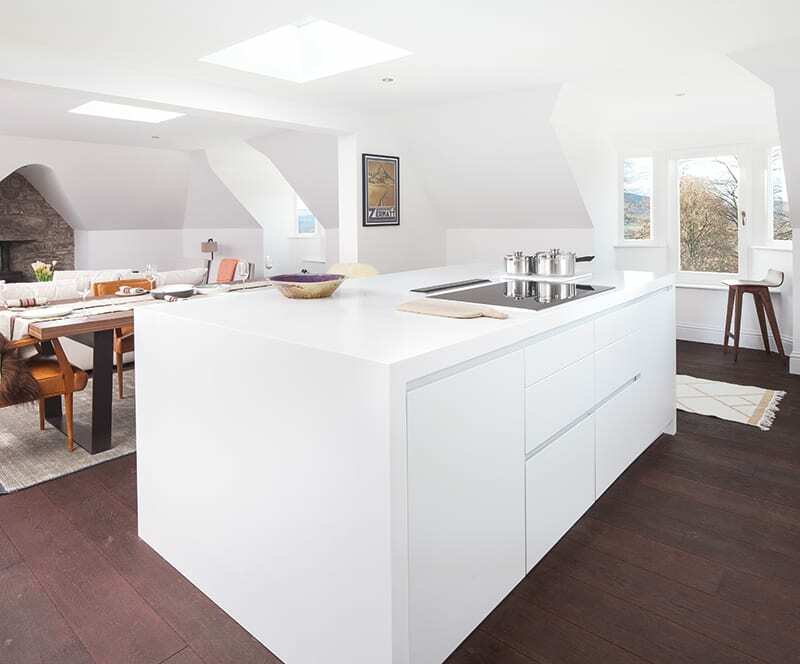 The Corian island is like a piece of furniture in its own right; in an open-plan arrangement, multifunctional pieces are key for fluidity and easy living. John and Susie relished the chance to decorate the renovated space, sourcing furniture and fittings from all over the world. “We were on holiday in Barcelona and we got chatting to the owners of Fins de Siecles, who source furniture from auctions all over Europe,” recalls John. “When they heard what we were doing, they took us to their warehouse on the outskirts of the city – it’s a treasure trove of Art Deco furniture.” It was here that they came across the antique French leather dining chairs and the 1920s Italian drinks cabinet. A trip to the Maison & Objet decor fair in Paris introduced the couple to Dutch brand XVL, from whom they got the sofa, dining table and marble-topped coffee table. Still in Paris, at the famous Saint-Ouen fleamarket, they came across 1970s steel-framed chairs. Now reupholstered, their classic, unfussy shape augments the room’s clean, modern scheme. A similar approach has been taken in the master bedroom, where walls have been whitewashed to encourage the natural light pouring in from the Juliet balcony doors to bounce around the room. The German Zeitraum bed, which looks as if it’s floating (its legs are hidden) was found at Tangram in Edinburgh. It has a luxurious walnut and leather headboard that complements the Danish Linie Design rugs. In the bathroom, Dornbracht’s nickel platinum Lulu range was chosen for its lack of ostentation –its quality and unadorned form being more than sufficient to do the job. This is a home that does not need frills and fuss to bring it to life. The use of classic shapes and a restricted palette has, in fact, has been the key to the success of this whole renovation project, allowing the contemporary interior to look and feel perfectly at home in its Victorian surroundings. Rather than slavishly sticking to the era’s design rules or creating a jarring juxtaposition of different periods, John and Susie have come up with a blend that is delicate and considered. The building might be 140 years old, but the inside simply won’t date. Next Next post: Summer issue out now!